WAFFLES: Hey Boss! Did you know it's Thanksgiving this week? What are YOU thankful for? KATIE: Well I'd be really thankful if you didn't try to kiss me. WAFFLES: Sorry, Boss. Personal space, right? KATIE: You're learning, Waffles. So Waffles, what are YOU thankful for? WAFFLES: You mean besides toys and snacks and chicken and stuff? KATIE: It's ok to be thankful for toys and chicken, Waffles. Those are things that make you happy. WAFFLES: How about Glogirly and Gloman and our nice forever home? KATIE: You really ARE learning, Waffles. We are very, very fortunate to be part of a forever family. There are SO many cats waiting in shelters, hoping for just a fraction of what we have. WAFFLES: You're right, Boss. We really are lucky. KATIE: And now we get to share the luck. Our friends at Peach Industries are sponsoring a very special kind of giveaway. The kind of giveaway that will brighten the lives of some of those cats waiting in shelters. To celebrate all that we're thankful for, we're giving one lucky GLOGIRLY reader a chance to win a Peach Industries Kitty Lounger for their favorite shelter AND, a sweet organic t-shirt for themselves! 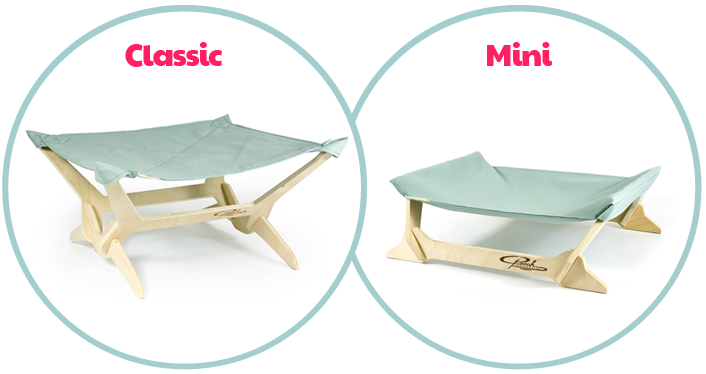 The winner can choose a classic or mini kitty lounger in their choice of fabric. Some shelters, due to certain regulations, aren't able to use furniture that has a wood base. 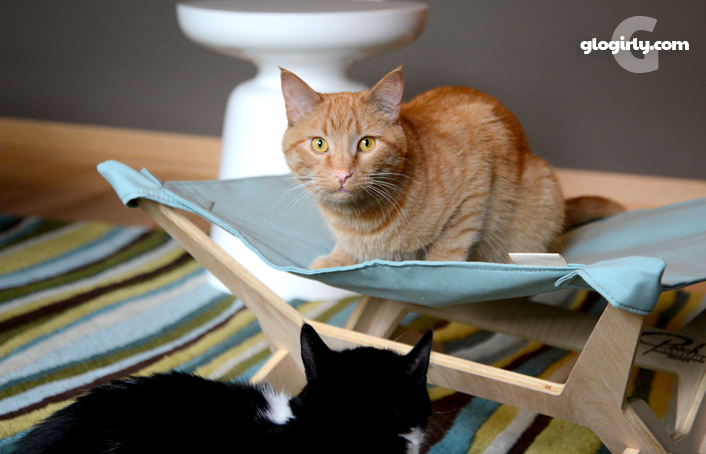 But there are SO many creative ways a shelter can put these loungers to great use. How Can a Kitty Lounger Can Help a Shelter? 1. Offer as a prize in a fundraising raffle or silent auction. 2. Send it home with a newly adopted senior cat. 3. Give to a foster family for a new mother and her kittens to use. Remember Nadya and her NINE kittens? 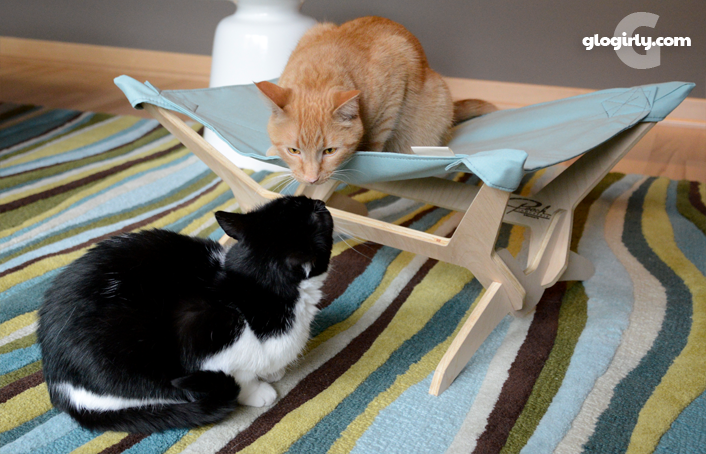 When Feline Rescue was given a lounger, they gave it to Momma Nadya. A Sweet Tee for the Winner! The winning reader will also receive a cool organic t-shirt in the design of their choice. Extended sizes are available. Although the kitty lounger must ship to a US 501(c)(3) shelter, the t-shirt can ship anywhere in the world. That means EVERYONE can enter. Good luck everyone. And thank you to our friends at Peach! NOTE: We are experiencing intermittent problems with Rafflecopter. Due to changes they have made to their giveaway widgets, ours and those on other blogs may be loading very slowly. If you don't see the widget, please try refreshing the page in your browser or restarting your browser. We've been in touch with Rafflecopter and hope to resolve this issue as soon as possible. We're so very sorry for the inconvenience. If you are not able to make it work, please leave us a comment and we will manually enter you in the contest. 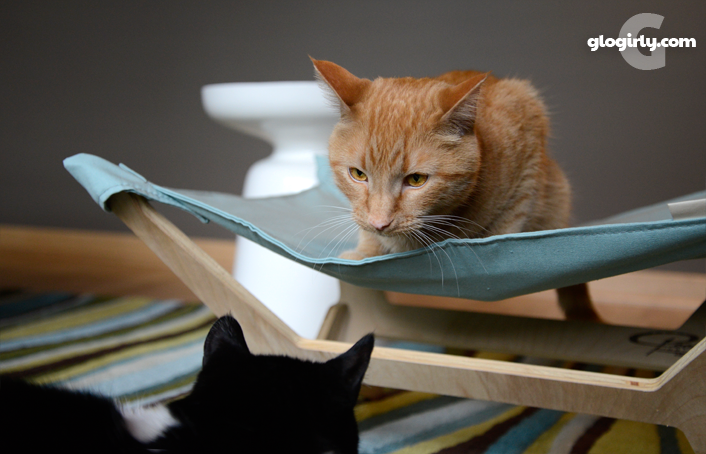 We received our kitty lounger no charge from Peach Industries. We also received a small fee to cover the time it takes to take photos, write the blog post and administer the giveaway. Receiving the free product and the fee did not influence our article or anything we say. All sponsored posts on GLOGIRLY will always reflect our honest opinions and feature products we use and love. We are thankful for friends like you! I am thankful for 3 crazy kitties. I'm thankful for my two kitties, Hansi and Violet. I'm also thank for all my facebook friends, including Katie, Waffles and Glogirly. Happy Thanksgiving! I'm thankful for friends and family, for having a roof over my head and food to eat. I <3 Peach Industries! They are such awesome humans! I'm thankful for my husband and my senior cats Punkin, Spicy, TC and Gin Gin! We're thankful fur mommy, our warm house, food, & mommy's job even though it keeps her away from us ... We love y'all too!!! Thankful for all the furfriends out there that end in furry but clean laundry, lots of hugs and kisses and great blogs like GloGirly! We are thankful for having such a wonderful forever home and all the great friends we have made blogging, feline and human. We are thankful for a loving home, a garden to walk in, enough to eat, a lap to snuggle on when the nights grow cold, and all our blogging friends. We're thankful for our great home and good foods we get to eat. And we're thankful for all our blogging furiends. We are thankful for our home, family & friends. Will be very thankful if vet can help Jade feel better. I am very thankful for my home and my people. If they had not adopted me, I was probably headed for a shelter. This is a super duper giveaway, Katie and Waffles. I'm thankful for my home, all the chicken I have to eat, and Sam and Maya, my two furbabies. I'm thankful for the 68 years I had with my mom. I love these loungers, and I SO wish they shipped to Canada! We are thankful for our forever and our human Mommy who does so much for us. Life is good. I am thankful for every day that I can share with my 4-legged friends. I am thankful for my dear cats, supportive husband, the opportunity to volunteer with kind people at PAWS, interesting work, friends, blogs, chocolate, gardens and flowers... where to stop? I am thankful that I am healthy, have a loving husband, a beautiful little cat and live in warm Southern California! We are thankful for being fortunate cats who have a roof over our heads, toys, and meals. 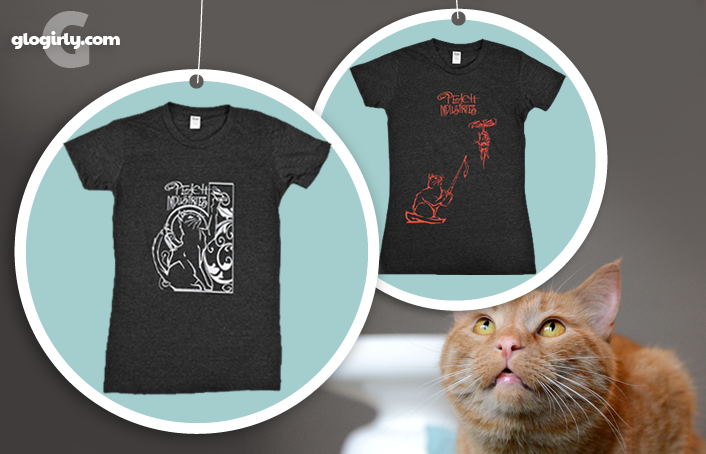 It's so wonderful that the Peach Industries humans are giving back to shelter cats! Truffles is thankful for her kitty lounger mini and would love to win one for our shelter! We're thankful for everyday we have on this earth. The loving family we have and our good friends. My local shelter would love to receive one of these for one of the kitty rooms. I’m thankful that Pop doesn’t mind when I bite him and won’t let TW send me back to the shelter. We’re very thankful we have a friend like Theresa who will drive TW to the supermarket when it’s cold and snowy or rainy. Katie & Waffles..Yes you two are so very lucky to be in your forever home and have two people who love you so much!!! I would love to be able to carry this great prize into the shelter and hand it to them..It makes me happy to put smiles on faces..human & kitty faces..
We're thankful for our tabby Hutch and for the shelter where we volunteer. Mike socializes the feral little ones and I am a photographer for their social media, Petfinder and local newspaper ads. The shelter would LOVE this! We are thankful for our home, for our friends and for our family. I'm thankful for my four cats (mother and her three kids)! All together as family, no one separated! Much to love!! We are thankful we can help other cats by fostering them. My kitties and having a nice warm place they let me share. I'm thankful for my little family, my man and our fur babies. Thankful for wonderful companies that help out shelters like this. We are thankful for special friends like you! We are thankful for our friends, of course, and for Feline Rescue, where I stayed before finding my furever home. I'm thankful for every kitty I've ever had the joy of loving. I am thankful for all the friends I have made through my blog, and for my home with my mum and dad. I'm thankful for my rescue Awesome Louie who brings me lots of joy and kitty kisses every day! I am thankful for my beloved kitties. Thanks for the giveaway. OMC Dat is so pawsum. Weez awe so fankful to be yous furiends and to hav a pawsum luvvin' furever home and....well da list goes on and on. But weez not hav one of those loungers. Weez sure wuld like to win dat. But weez not able to enter. Weez know yous aware there awe purrawlems, but we wanted to let yous know we wuld like to be entered. Fank you. Waffles is catching on to stuff? Amazing! We are thankful for so many wonderful, caring friends. I lost my brother, my mom, and my father, so the only family I have left is my sister (and her family), my three daughters, and my furbabies. I'm thankful for them. OK we blame mum and her shop for nearly missing this!! We have a shelter we can numminate! We are just thankful we have a warm home, love and the friendship of others. This is a really cool giveaway. I know many kitties at our local shelter who would really enjoy a lounger! I'm thankful for good health and wonderful family and friends. TRUELY BLESSED! What a great giveaway! Those loungers look super comfy! BTW, the fabulous Nadya, mother of the year, and her adorable girl child, Zotz, are still awaiting their forever people and home. Stop by "available cats and kittens" at www.felinerescue.org and get their contact information. I am thankful that everyone in my family (including the pets!) is happy and healthy this year. You two and your parents are the best of people and kitties! I am thankful for the love of my two cats, Madison & SImba...even when they have a hard time showing it to each other. I'm in CAN so I guess it would just be the shirt - would love to win though - thanks. Faraday: Um, Waff? So when Katie mentioned KISSING didn't that, like, just TOTALLY gross you OUT an' stuff??? I'm thankful for my family including my two kitties! I'm thankful for my 4 nutty kitties! We are thankful for all of our wonderful blogging friends and our wonderful life with our Mom! I'm thankful for the health of myself and my family. I'm thankful for my family, friends and the 4 legged members of our family.